Two years ago Enfant Terrible released the Electronic Renaissance compilation LP (Enfant04). A record that is now considered a cult item, and one of the highlights in the Enfant Terrible catalogue. This record functioned as a reflection on the contemporary state of elektro wave and as an impuls for new talents in the field of independent electronic music. 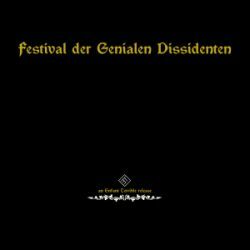 With Festival der Genialen Dissidenten Enfant Terrible releases a new compilation with again only contemporary artists. On this record there are only projects that were not present on Electronic Renaissance. Next to that the variety of sounds and moods is broader as on the previous compilation. We are proud to present this new gathering of musicians who are all independent, open minded and full of passion about their work. Experience our dissident electronic music: electronic sounds not fitting everyday elektro and pop music definitions. We do it like nobody else does it or dares it…. The compilation comes on a 12″ LP and a 7″ single, in a decadent gatefold sleeve with a thematically fitting painting by Maaike.